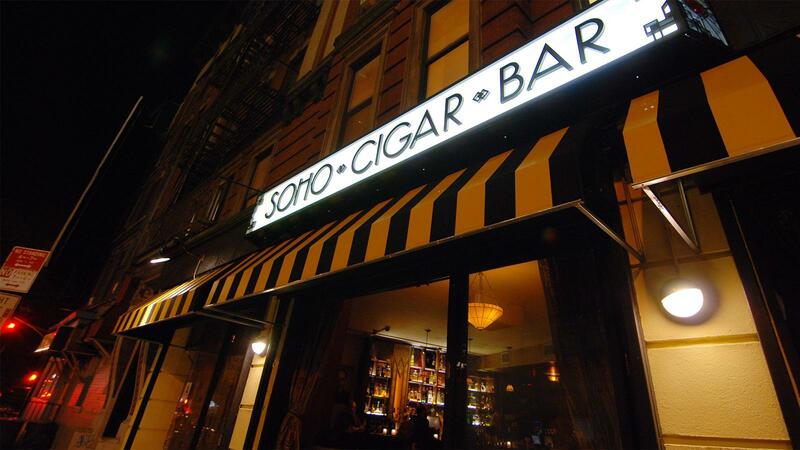 Soho Cigar Bar, the downtown New York City cigar bar formerly known as Circa Tabac, has turned 20 years old. Lee Ringelheim opened the establishment on Watts Street back in 1998. Ringelheim originally had the idea of creating a place for people to enjoy various forms of smoking, particularly cigarettes, but today Soho is a true cigar smoker’s haven. Soho has a large cigar list, with familiar brand names such as Alec Bradley, Arturo Fuente, Ashton, Padrón and Rocky Patel. Soho also has its own house brand listed on the menu by flavor profile, with descriptors such as rich, spicy and light, in nine varieties. The bar also has an equally impressive menu of drinks, with a list of whiskies from around the world, including Japan, Kentucky and, of course, Scotland. The list includes some eye-catching, high-end rarities, such as Hibiki 21 year old from Japan, Laphroaig 30 year old from the Scottish island of Islay and some limited pours of Pappy Van Winkle from Kentucky. There are also plenty of more affordable whiskies priced below $20, along with other spirits, cocktails, wine and beer. The cigar bar has several clever touches, including a coat rack with full-length plastic bags to keep your outer garments from soaking up the aroma of a cigar while you puff, perhaps allowing for an easier return to the non-smoking world when you depart. Soho is dark, classy and inviting, with cocktail tables and comfortable seating. A black and white photo of Dean Martin, Sammy Davis Jr. and Frank Sinatra hang on one wall. You can almost imagine the Rat Pack sitting here for a smoke.